Wuhan: Latvia's Jelena Ostapenko sunk Spaniard Garbine Muguruza at a shock-prone Wuhan Open on Thursday, powering through a tight match to bag a 1-6, 6-3, 6-2 victory against the World No 1. Ostapenko, the only seed left in the competition, will now square up to Ashleigh Barty in the semi-finals after the Aussie pulled off a major upset against former World No 1 Karolina Pliskova. Maria Sakkari of Greece will go head-to-head with France's Caroline Garcia in the second semi, meaning all four players are aged 23 or under. Ostapenko, this year's Roland Garros winner, won the last six games of a compelling match against Muguruza, scoring her first win over a reigning World No 1 and extending her winning streak to eight in a row. 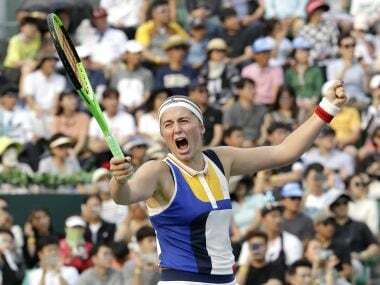 "It's my first time beating No 1 in the world and hopefully not the last time," said Ostapenko, seeded eight. "Today I had no pressure because I knew I'm playing a great player, so I just went out there and tried to show my best and played very well." Muguruza, who had been hunting for her first victory as the top-ranked player in the world, found herself grappling with a knee injury that has plagued her for the past two weeks. "I was struggling with my game obviously," she said. "It was a close match at the end, three sets. It was tight." "Today she (Ostapenko) went for her shots, she served pretty good and she returned very good as well," she added. Elsewhere Barty downed Pliskova, the No 3 seed, 4-6, 7-6 (7/3), 7-6 (7/2). Barty, ranked 37th in the world, failed to convert three match points in the third set but dominated the deciding tiebreak to bag her first ever win against a top-five player. The 21-year-old Barty had already seen off Agnieszka Radwanska, seeded nine, and Johanna Konta, the fifth seed in a dream run in the humid Chinese city. 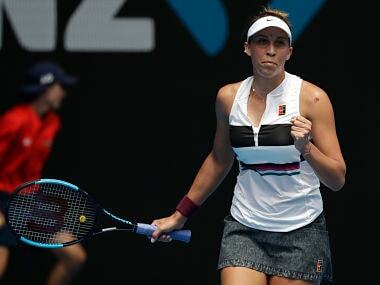 "I played a really good match and I'm just happy to come through at the end," she said. "It was really important for me to look after my service games and obviously try and make inroads into Karolina's games and I was able to do that." The Czech, who is the World No 4 but who spent eight weeks at No 1 this year, had looked strong in the earlier rounds as she breezed past China's Zhang Shuai and Wang Qiang. "I think she was playing just a little bit better today," Pliskova said. "Even though it was really close, one or two points... I think she was just more aggressive." In the other quarter-final matches, Sakkari pummelled France's Alize Cornet 7-6 (7/2), 7-5 and Garcia triumphed over 7-6(7/3), 6-4 over Russia's Ekaterina Makarova.